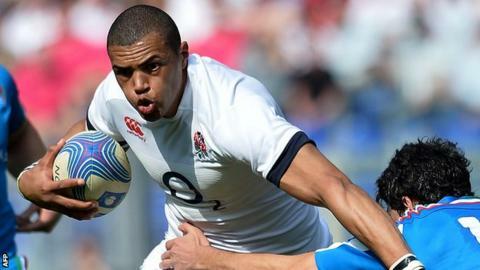 Northampton Saints centre Luther Burrell has said he does not feel like a proven England player, despite his starring role at the Six Nations. The 26-year-old started all five games and scored three tries as England finished runners-up. "It feels quite surreal now. I question whether it really happened," he told BBC Radio Northampton. "It was quite an experience. But I've had to try to put that to the back of my head and get back to club rugby." Burrell made a try-scoring debut for England in the Six Nations opener against France and added scores against Scotland and Wales. The former rugby league player joined Stuart Lancaster's squad for the summer tour of South America last year and was among the group for the winter internationals, but had to wait until February for his first appearance. "Do I belong with England? I don't know," Burrell said. "I'm still learning the trade and trying to get better each week. "If more international games come, it will be brilliant." Saints suffered a poor run of form when their group of England players - Burrell, Dylan Hartley, Courtney Lawes, Tom Wood and Lee Dickson - returned from international duty, losing three consecutive Premiership matches until the win over London Irish two weeks ago. But former Leeds and Sale back Burrell has said readjusting to club rugby did not affect his game. "It's not been too hard. I thought the way England used me was similar to how Northampton used me in the 12 shirt," he said. "Obviously with England there's the circus and the fan base that surrounds it. "But we get fantastic crowds here at Northampton. So I don't think the transition on a personal level has been that difficult for me."